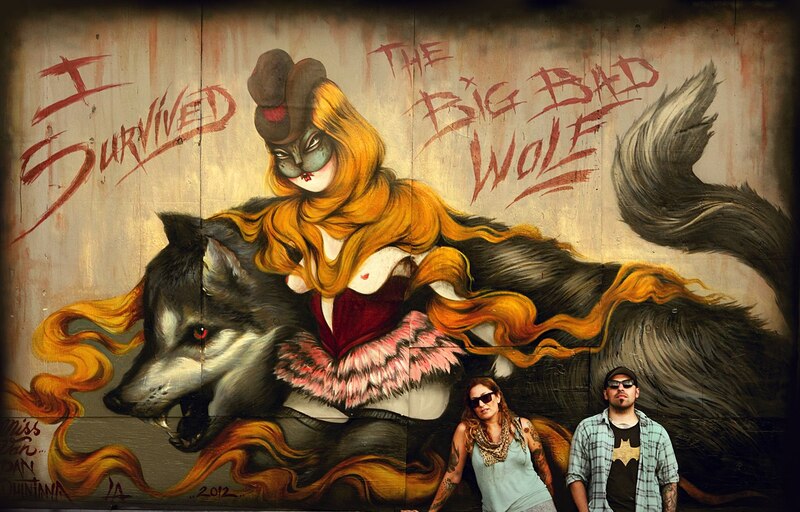 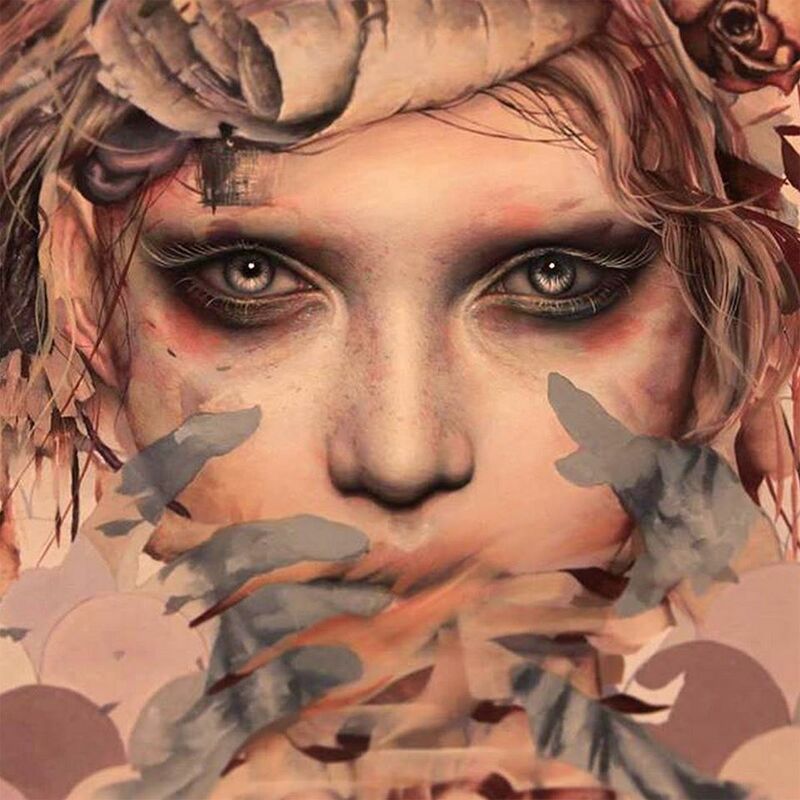 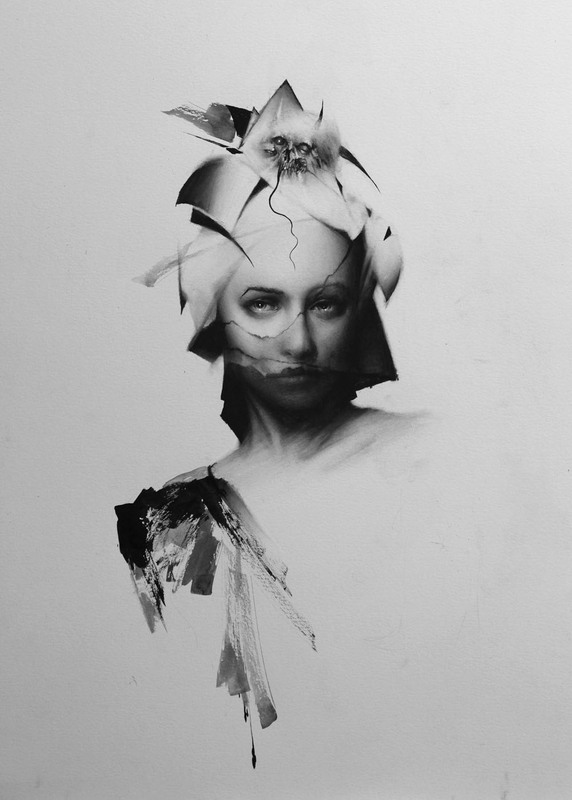 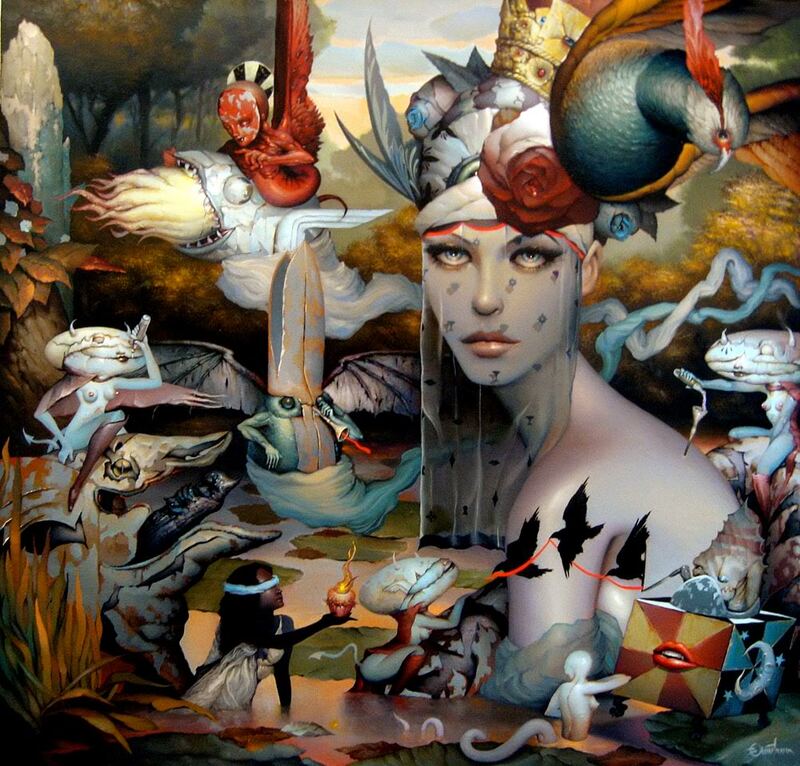 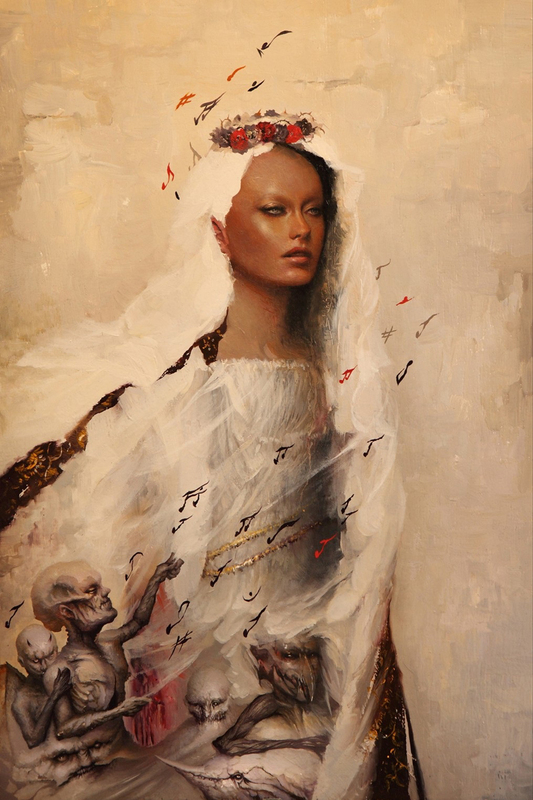 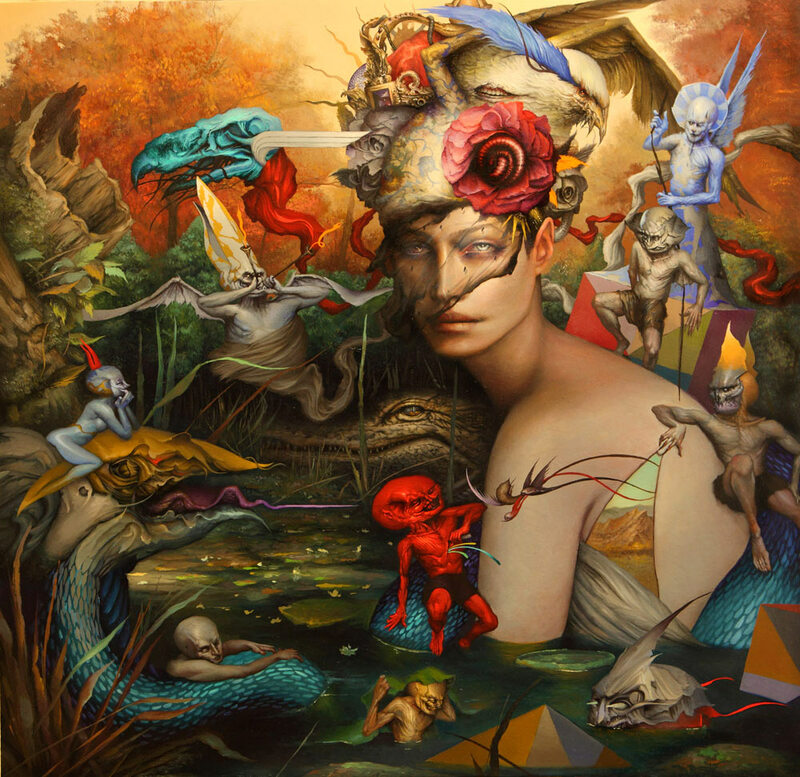 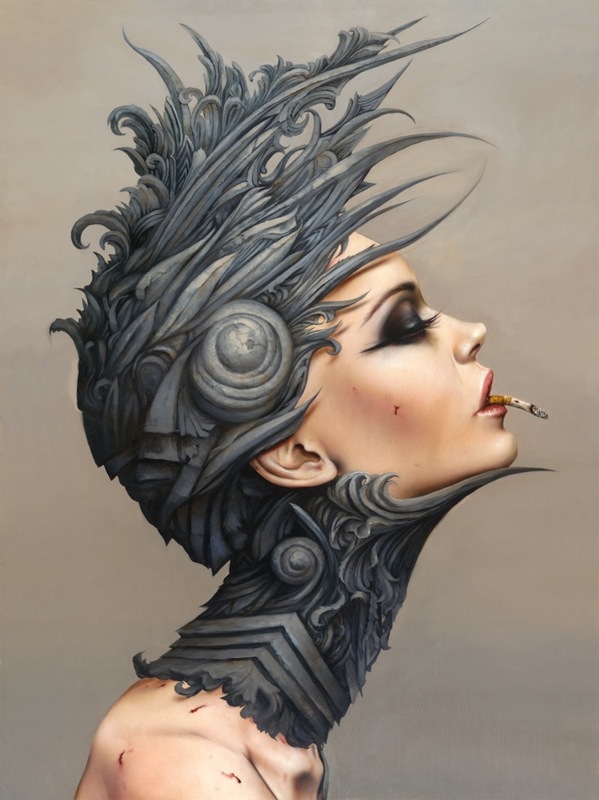 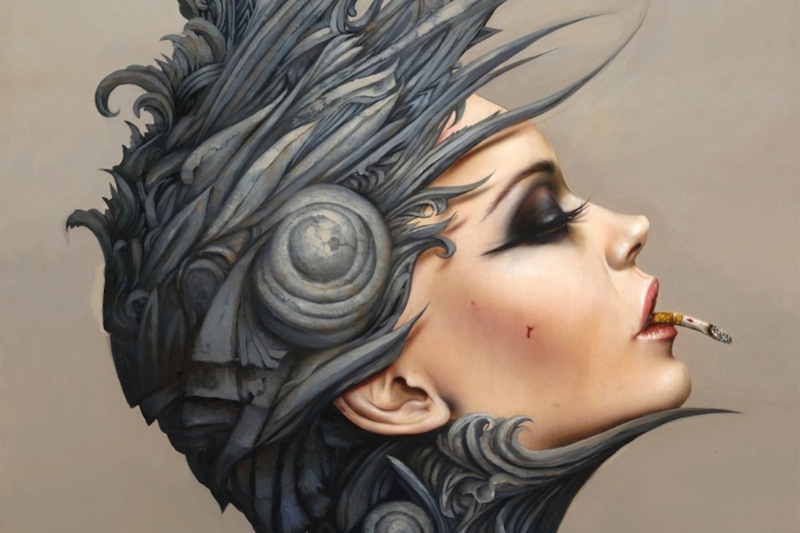 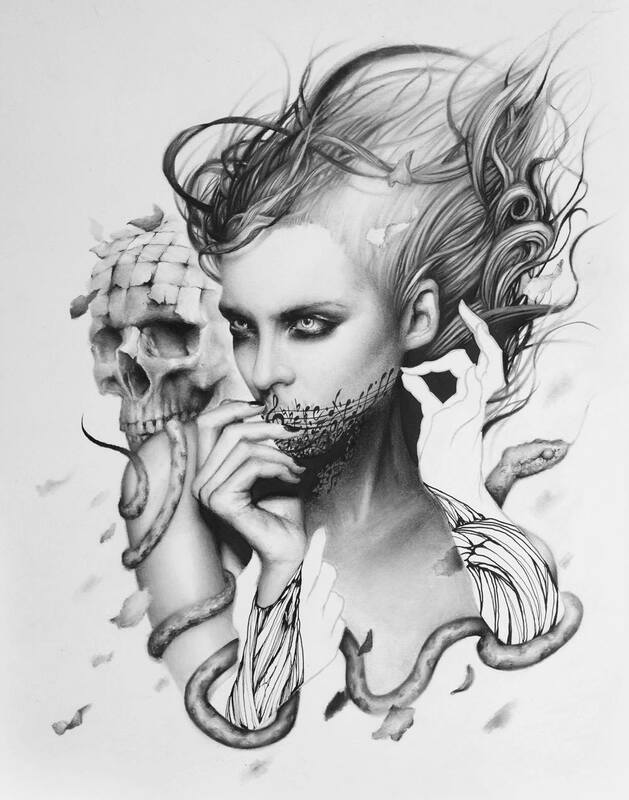 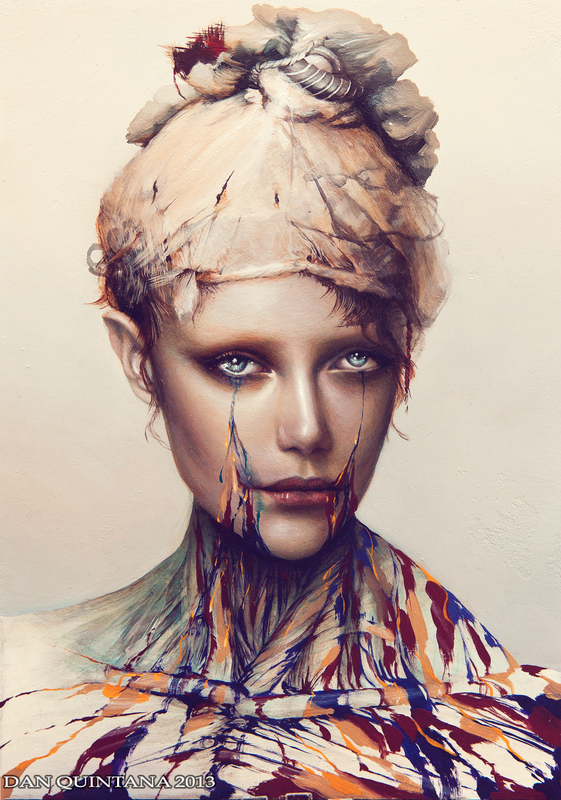 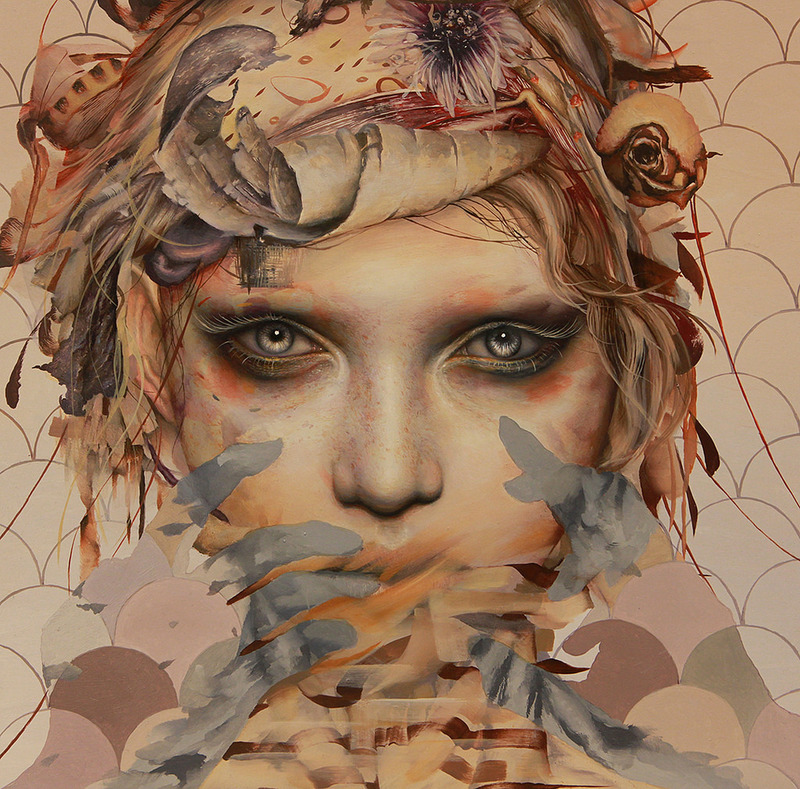 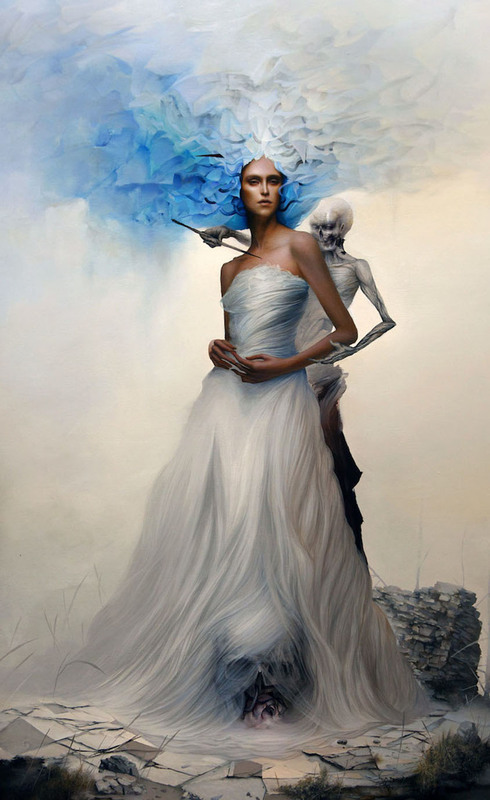 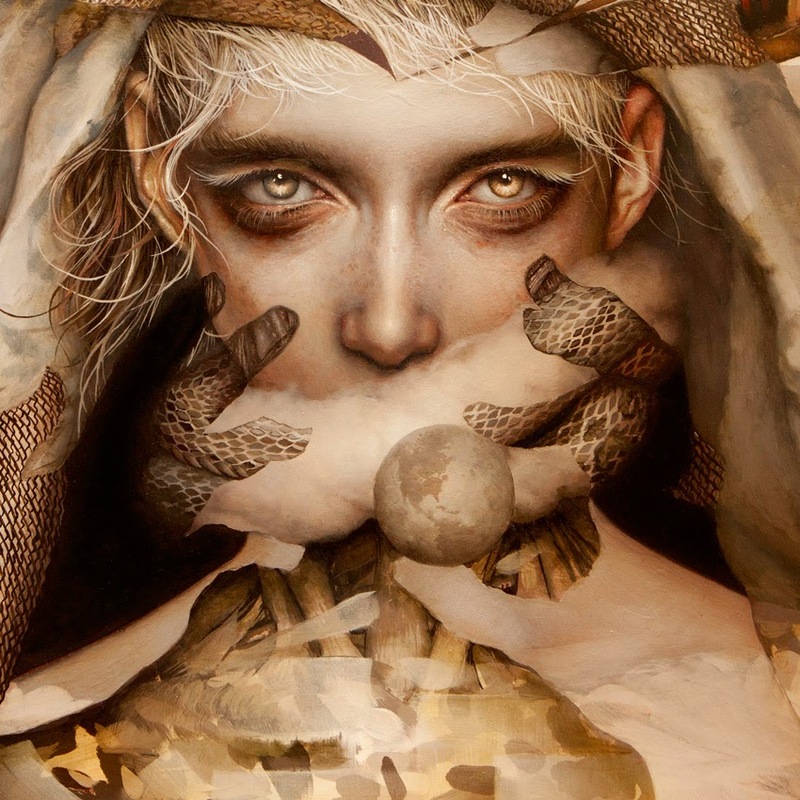 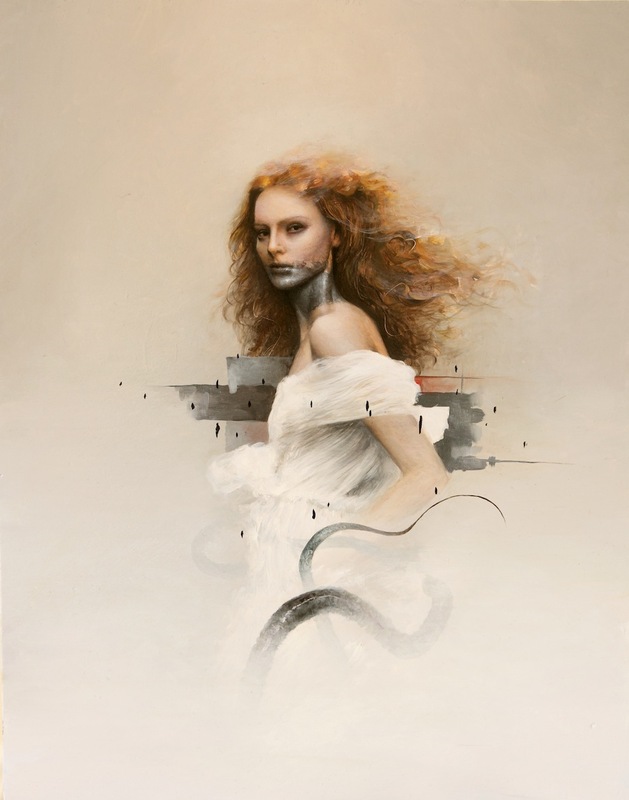 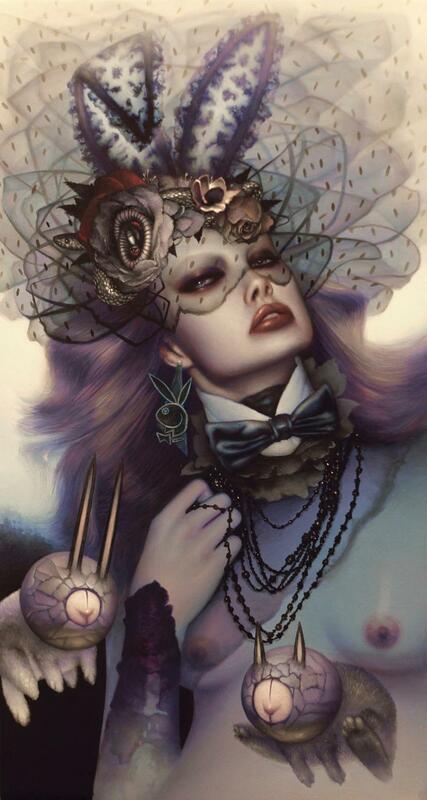 A Los Angeles native, Dan Quintana began experimenting with oil painting in high school then shifting his focus to street art, creating numerous murals, many of which can still be seen around Los Angeles. 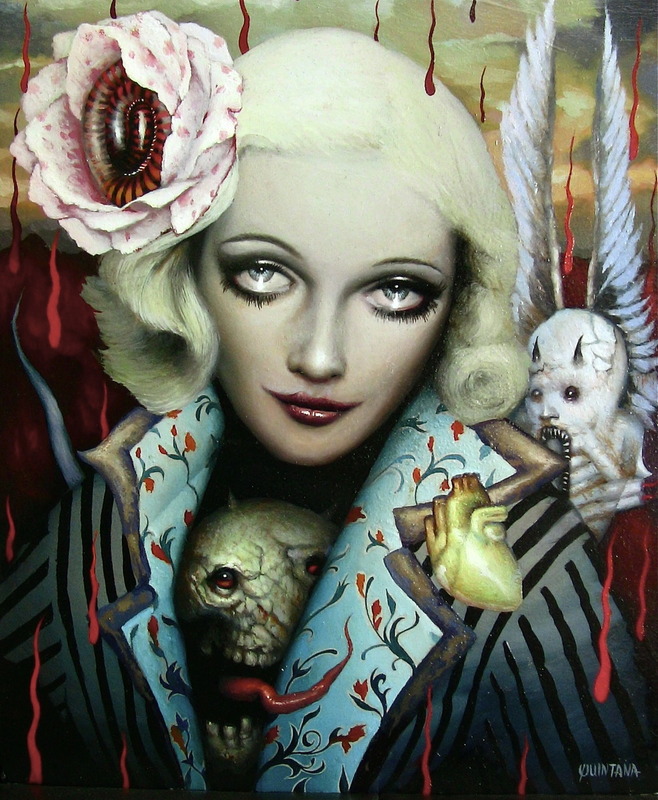 In his early twenties Quintana embarked on commercial commissions for numerous music labels, tee-shirt designs etc. 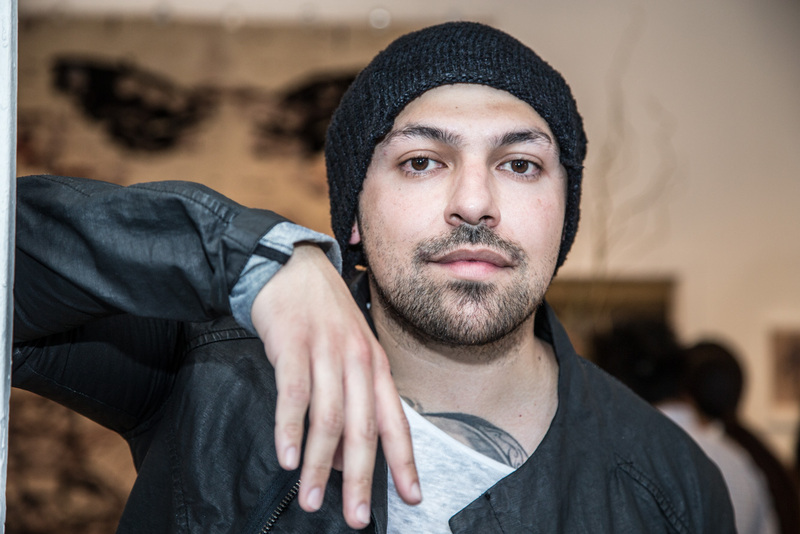 Quintana's talent has also found a home in the custom car culture in his work as artist for West Coast Customs on the MTV show Pimp my Ride and TLC's Street Customs and he has been featured in publications including LA Weekly, Juxtapoz, Hi Fructose, Car Kulture Deluxe and more. 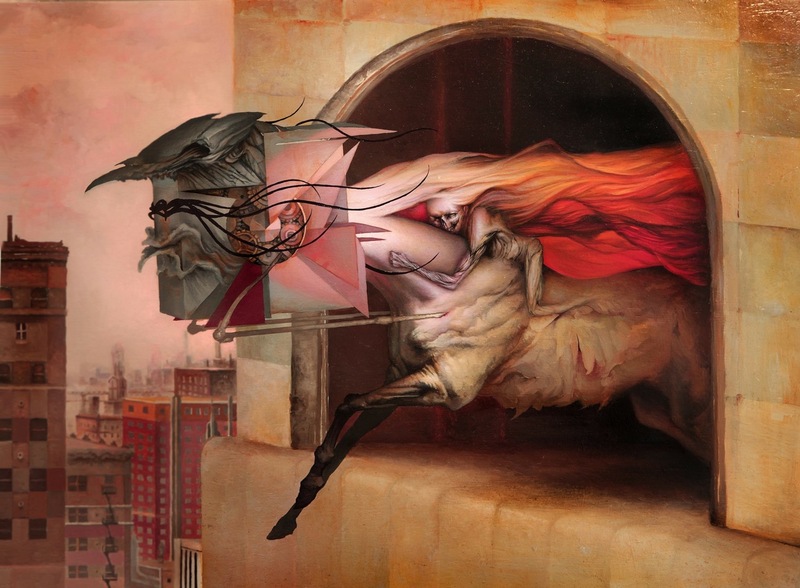 One painting features a ghost horse plummeting earthward with its demonic, also-rotting human companion. 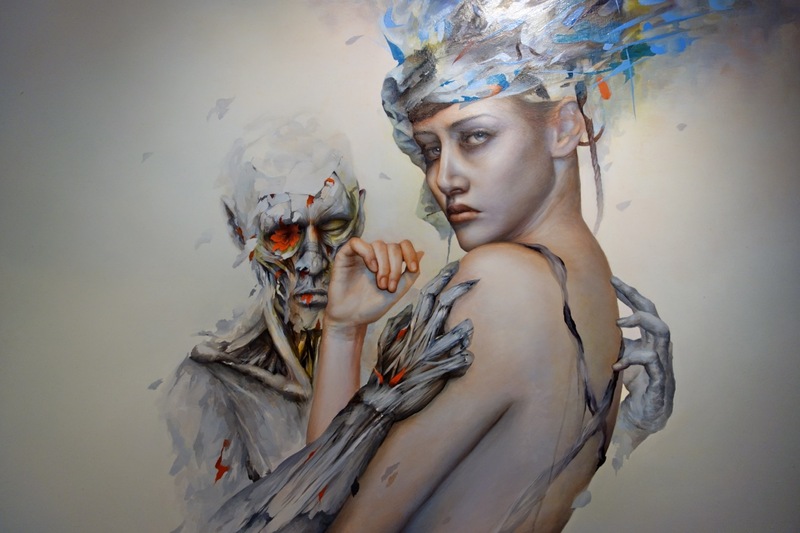 Using overlapping shapes and translucent layers, Quintana strips away flesh from his subjects, revealing grisly anatomies of muscle and bone. 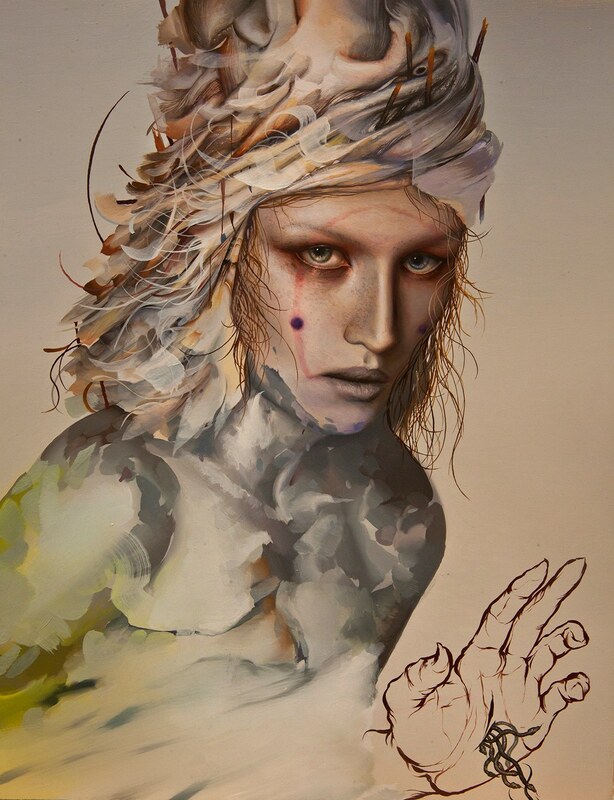 With his eclectic style and masterful attention to detail, Quintana channels the otherworldly imagery of Dutch painter Hieronymus Bosch while also blending in modern motifs and geometric patterns. 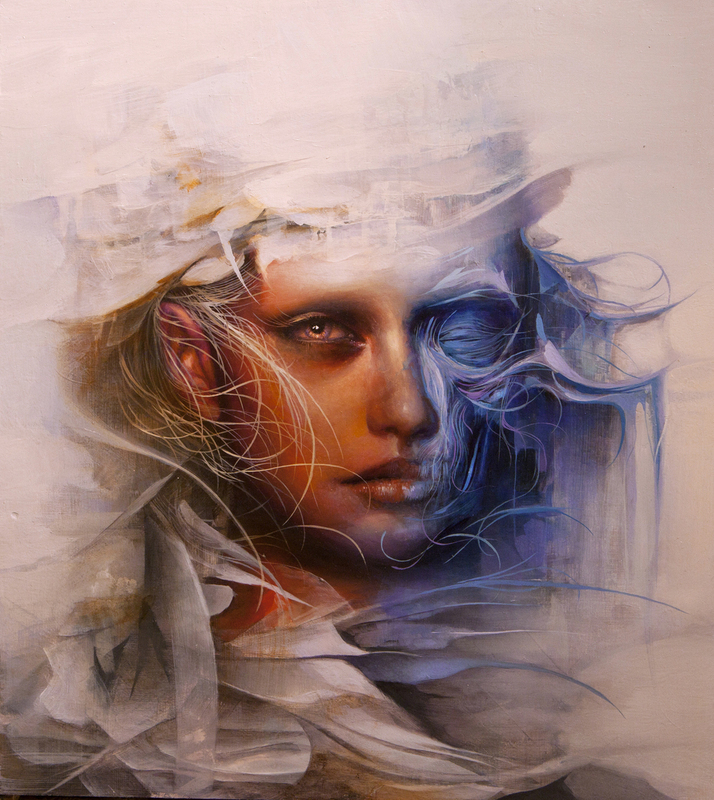 Color and light play important roles in Quintana’s work. 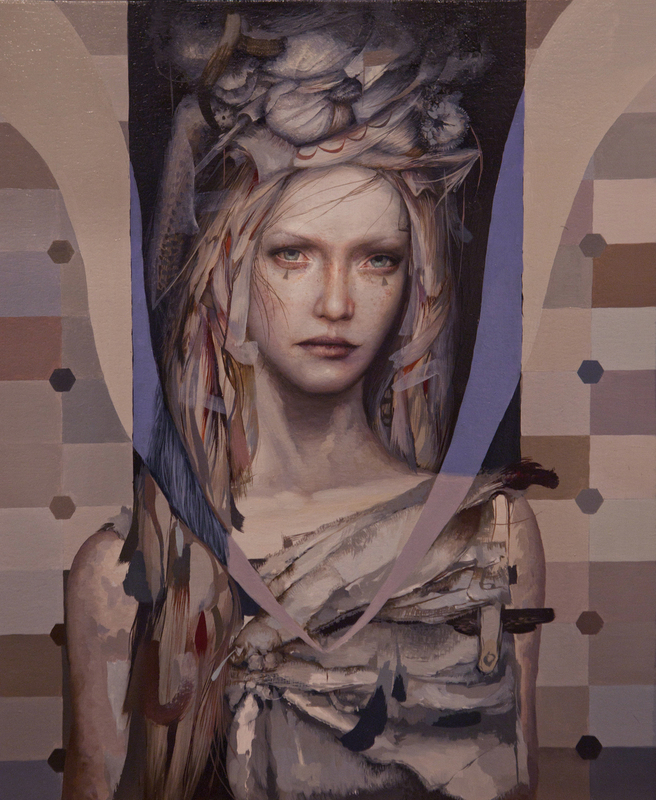 Most of his recent paintings are muted in shades of gray and brown, invoking a look that’s both antique and corpselike. 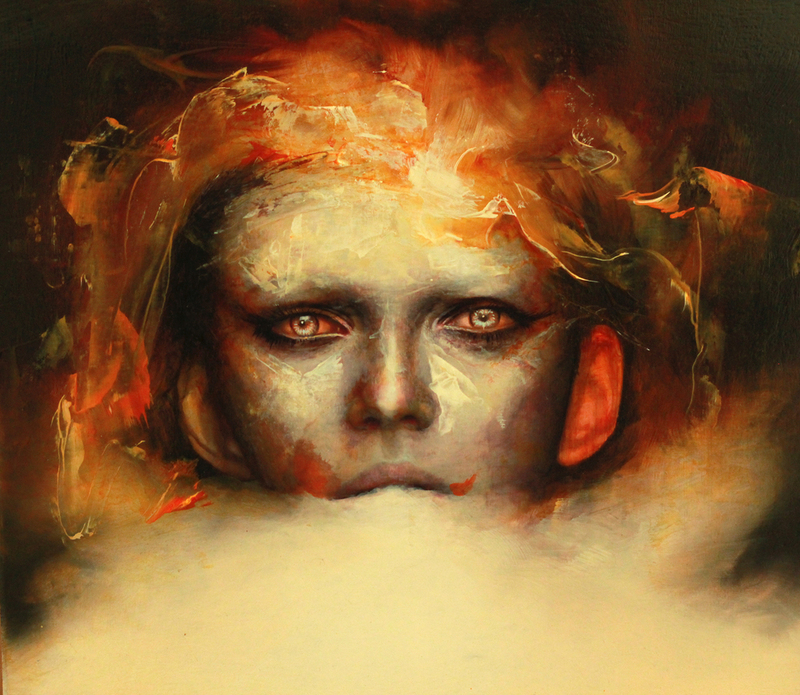 As the word “Diffused” implies, light is distributed in an exploratory fashion in these works. 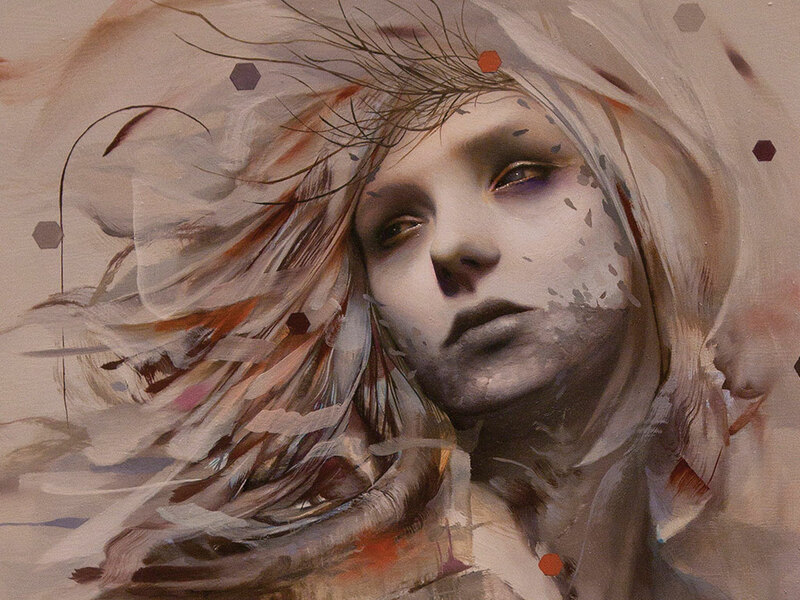 Often the figures’ outlines are obscured and partially dissolved, making it unclear where their forms begin and end; in the artist’s own words, “we see the light in these figures dispersing faintly into the open vast space until it ceases to exist” (Source). 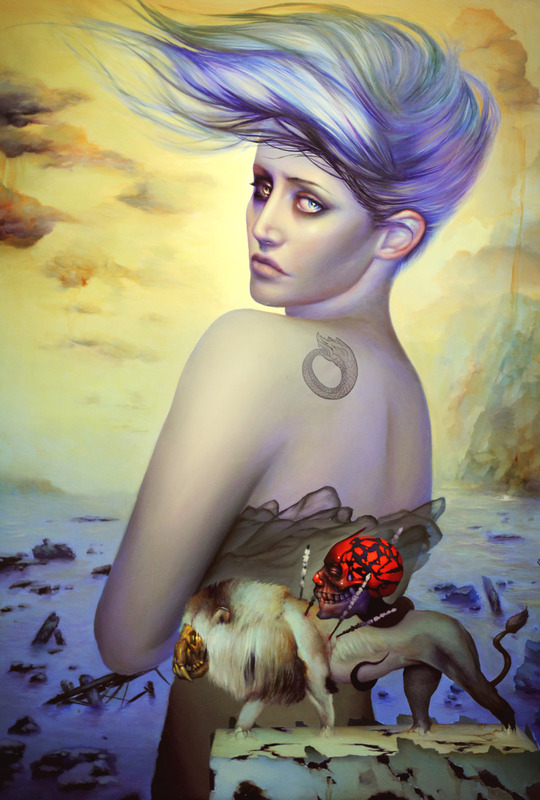 For Quintana, light is a symbol of life. 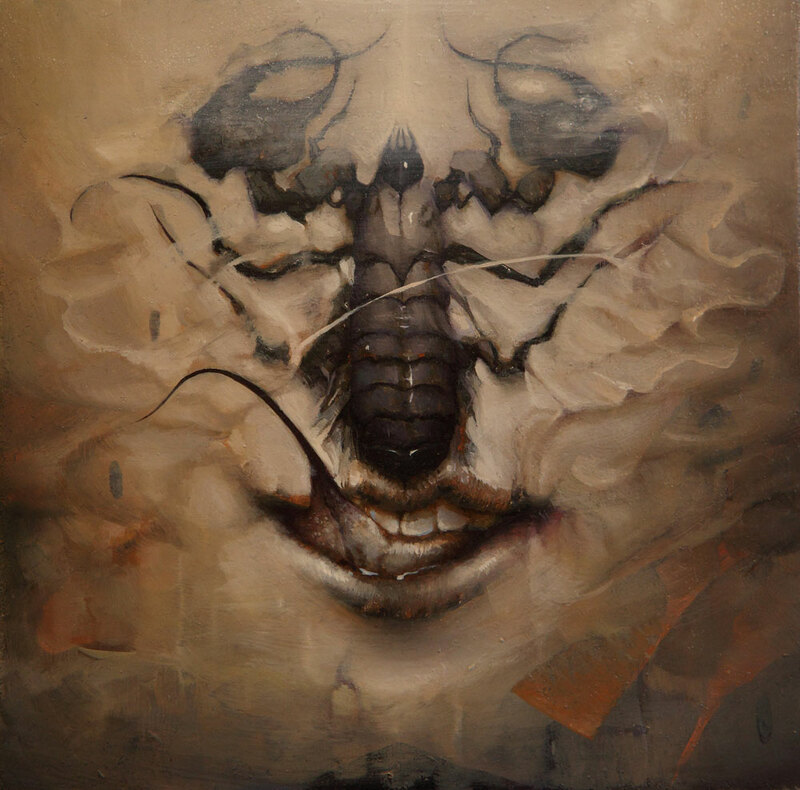 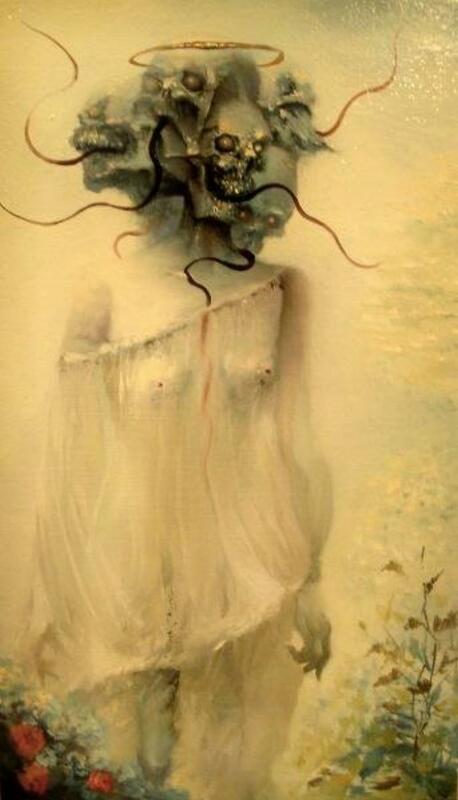 Used in fluid but contrasting ways with the shadowy, cadaverous imagery, Quintana’s work seems to explore a symbolic co-relation between the forces of life and the stark realities of death. 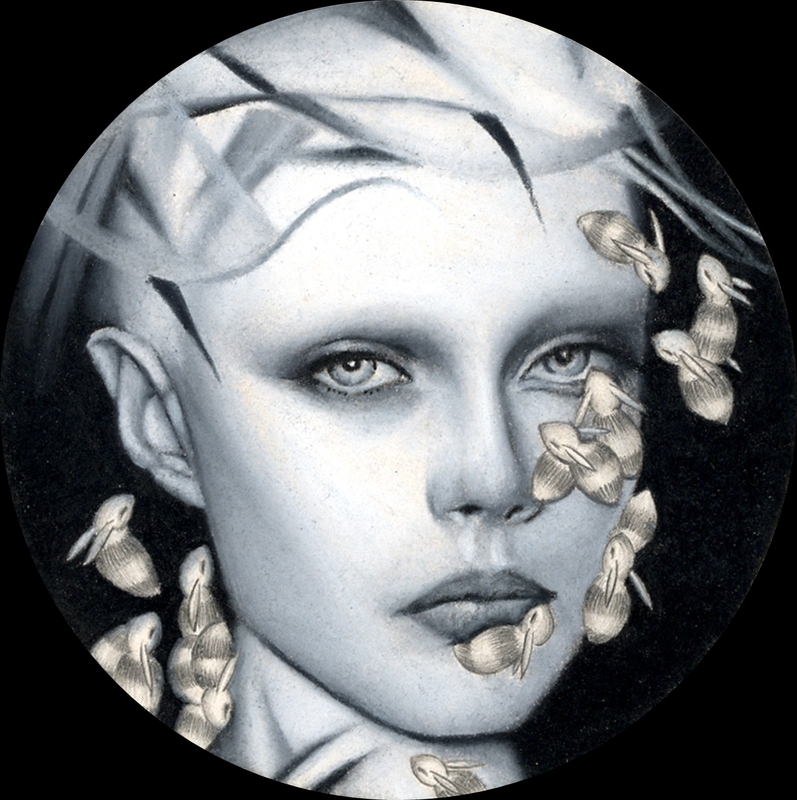 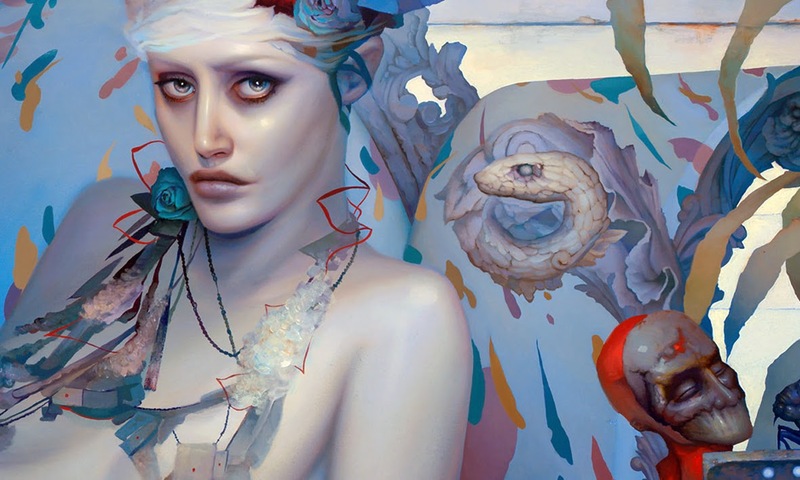 Dan Quintana è un artista di grande talento proveniente da Los Angeles, California, dove vive e lavora. 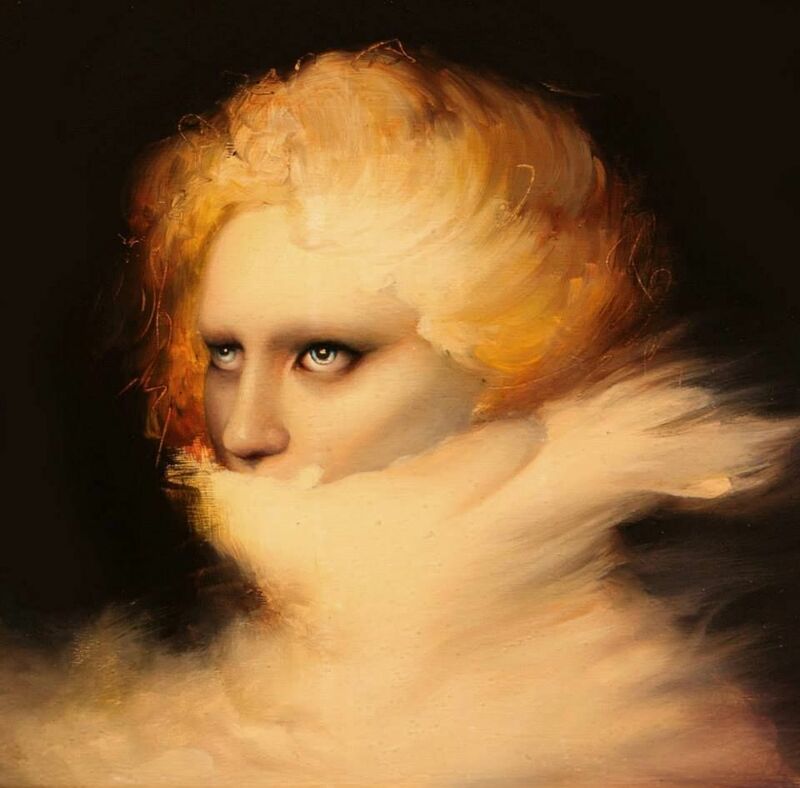 Dipinge quadri surrealisti intrisi di un simbolismo vivido e inquietante. 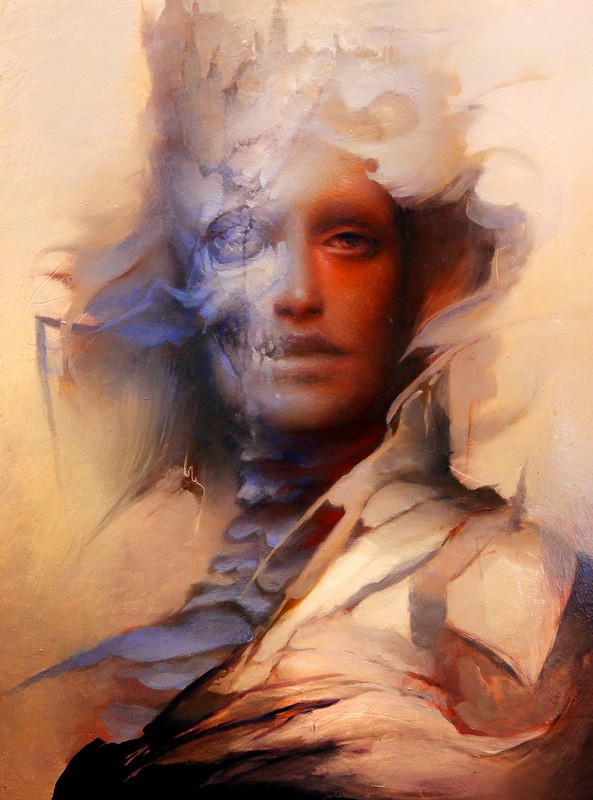 Le sue visioni oniriche sono splendidamente realizzate e ricordano le tele dei grandi maestri olandesi e fiamminghi. 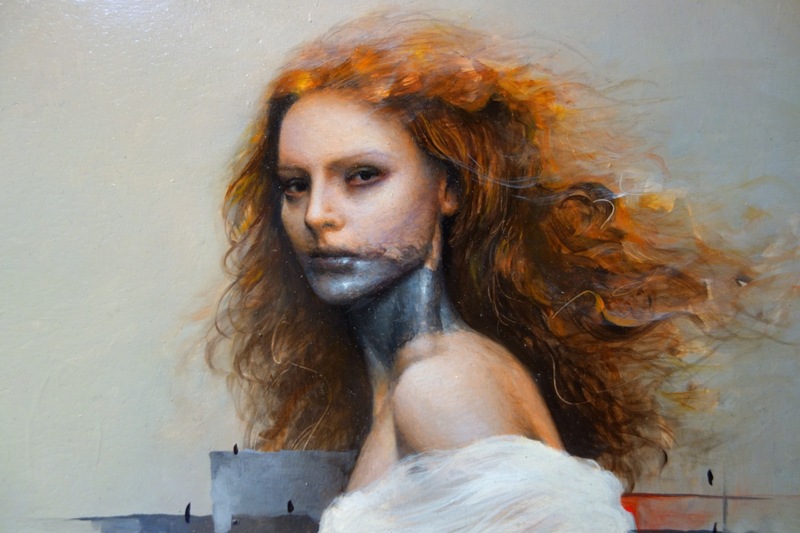 Dan Quintana sembra voler trasmettere messaggi simultaneamente all'ostilità ed alla vulnerabilità dell’essere umano.